The ticket-taker at a movie theater was surprised at his own star power, after his fans found out he was homeless — and raised $65,000 for him. 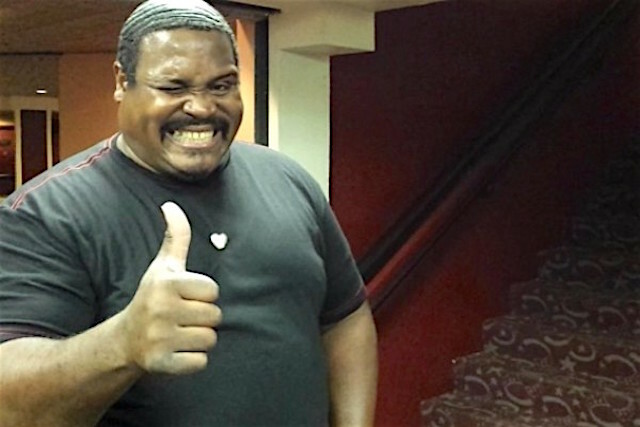 Eric “Fluffy” Glover has been a featured attraction at the Morristown, New Jersey theater where he’s worked for nearly 30 years. He’s locally famous for providing his own sound effects and flamboyant acting. He’ll click like a printing machine and flail his arms as he tears the tickets. But he temporarily lost his job when the theater shut down. Later, it’s new owners re-hired Glover, but only part time — just two or three nights a week. Meanwhile, he lost his home and was living in his car, at shelters, or with relatives. For 10 months, he was too ashamed to tell anyone he was homeless. He’s a pretty good actor — even his own children didn’t know his situation — but as soon as a Morristown movie fan figured it out, Glover’s story got a real Hollywood ending. Lidia Udrija set up the “Helping Eric Glover” GoFundMe page and raised $65,805 to help get him back on his feet. The first $40,000 came in in just four days. His new employers with AMC Theatres said they were unaware of Glover’s situation and will enroll him in an employee assistance program. It wasn’t just money that came pouring in; At least one commenter offered a room to Glover, while others shared some movie memories.